Book 4 of Tacitus' Annals, described by Sir Ronald Syme as 'the best that Tacitus ever wrote', covers the years AD 23-28, the pivotal period in the principate of the emperor Tiberius. Under the malign influence of Sejanus, the henchman who duped him and was loaded with honours, Tiberius withdrew to the island of Capri and was never again seen in Rome, where the treason trials engendered an atmosphere of terror. The volume presents a new text of Book 4, as well as a full commentary on the text, covering textual, literary, linguistic and historical matters. The introduction discusses the relationship between Tacitus and Sallust. The volume completes the sequence which began with commentary on Books 1 and 2 of the Annals by F. R. D. Goodyear (1972, 1981) and was continued by commentary on Book 3 by A. J. Woodman and R. H. Martin (1996) and on Books 5-6 by A. J. Woodman (2016). Preface; References and abbreviations; Introduction; Text; Commentary; Indexes. A. J. Woodman is Basil L. Gildersleeve Professor of Classics Emeritus at the University of Virginia and Emeritus Professor of Latin at Durham University. He has published numerous books, including fourteen previously with Cambridge University Press. 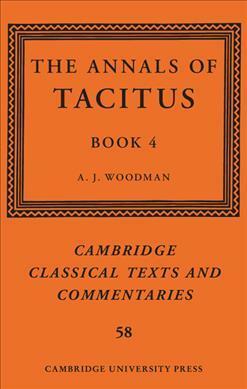 This is also his fifth edition for the series Cambridge Classical Texts and Commentaries, his most recent being The 'Annals' of Tacitus: Books 5-6 (Cambridge, 2016).